The second step in the finishing process is usually sandpaper, although on certain commercial operations and occasional homecraft jobs, this step can be replaced by a course with the "mud-wheel" or the tumbling-barrel. In the main, however, a careful sanding with very fine sand-paper, from 6-0 to 8-0, is an essential step in every project. It will be found that the garnet type will stand up much longer and clog less than the silica type of paper, and either the ordinary or wet-dry can be used. Sandpaper of this fine grade will not remove deep tool-marks, or very coarse sand-paper marks in the middle of a large surface, and it is a waste of time to try it. If any bad marks are present, the only method is to work down with succeedingly finer grades of sandpaper until you have reduced the surface to the point where 8-0 can handle it without too much labor. For a perfect job, every surface of a plastics project must be sanded, even though it may appear to the eye to be ready for buffing. This applies particularly to those surfaces which have not been touched by tools, but are still in their original shape. There is occasionally a slight "scale" on the original surface which has a very slight ripple, and this combination will show up on your finished job unless it is taken off with sandpaper. When sanding these original surfaces, sand until none of the original glaze is visible, then you are ready for buffing. Most sanding with fine paper is done by hand, but there is no reason why part of it cannot be done with power tools carrying the proper grade of paper and handled with care. A sand-ing-belt, sanding disc or various shapes of sanding drums and loose sand-belts such as are used by pipe-makers see Figure 20, will cut fast and save a lot of time, the only caution being to avoid the possibility of burning by holding the material too long in one spot. Fig. 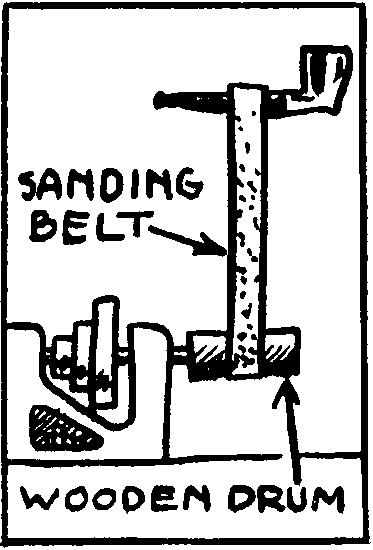 20. a pipe-maker's sanding-belt, which can be osed for various operations in plastics. The belt is driven by a wooden drum, and its sanded surface is on the inside; the object being sanded is held in the hand. If a large quantity of work is being done with power sanders, they can be run wet to hold down the dust, or an exhaust system can be used. In the home workshop, if the dust is found objectionable, an ordinary vacuum-cleaner can be rigged up with a funnel at the sander. The standard sheet of cast resin is 6"x16". This comes directly out of a mold and has a reasonably smooth finish. Some companies however also make a 12"x24" sheet, which is sawed from a large block. These sheets have saw-marks which must be sanded away, which is a laborious process with fine sandpaper. The remedy is to use two or three grades in succession, or to use the type of power sending-belt or portable belt-sander such as is used in cabinet shops for finishing table-tops, etc. In this as in subsequent operations, care must be used to preserve sharp edges and corners, if their preservation is a point of importance to the finished design.